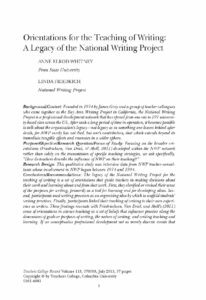 The legacy of the National Writing Project for the teaching of writing is a set of orientations that guide teachers in making decisions about their work and learning about and from that work. These findings resonate with Friedriechsen, Van Driel, and Abell’s (2011) sense of orientations in science teaching as a set of beliefs that influence practice along three dimensions: ‘beliefs about the goals or purposes of science teaching, beliefs about the nature of science, and beliefs about science teaching and learning’ (p. 373); where here orientations were found to center on goals or purposes of writing, the nature of writing, and writing teaching and learning. These orientations—toward the purposes of writing and the value of students’ ideas, toward supporting students through the writing process, and toward coherence between one’s writing life and one’s teaching life—at times recommend specific strategies and certainly inform specific decisions about strategies but also transcend any particular set of lessons or strategies a teacher might use to constitute an overall stance. This fact sets the NWP apart from many other professional development models—and has made it difficult to conduct research on NWP in a way that both captures the ideas that matter to its participants and capture observable changes in classroom practice (Rogers et al., 2011). Understanding orientations matters, not only for the National Writing Project, but for those concerned with professional development and its long-term influences. We argue that orientations establish a framework for teachers to organize and synthesize new knowledge and practice that they encounter over the course of their careers. For example, through a case study follow-up, we learned how one Legacy study participant who taught English Language Learners used these three orientations to focus her instructional practice and integrate new research and strategies over the course of her 30-year career (Meyer, 2009a). If we conceptualize professional development not as merely discrete events that have a linear and concrete impact, but as a decades-long series of encounters with ideas and strategies, then orientations help the field envision how individual teachers, as well as networks such as NWP, can bring coherence to a fragmented and changing landscape. We also offer this study’s design and analysis as a possible approach for long-term influence of conceptually based interventions.